Natural gas (NG) is a fuel gas which is used in steel plants as an auxiliary fuel for injection in blast furnace, for the production of gas based direct reduced iron, and for heating in various furnaces subject to local availability and the cost. NG is an environmentally friendly non renewable fossil fuel which is found in underground deposits in its gas phase. It exists as a gas under atmospheric conditions. It is basically a hydrocarbon gas mixture consisting primarily of methane. It is a clean fuel with a high efficiency. NG is normally supplied as (i) piped natural gas (PNG), (ii) compressed natural gas (CNG), and (iii) liquefied natural gas (LNG). 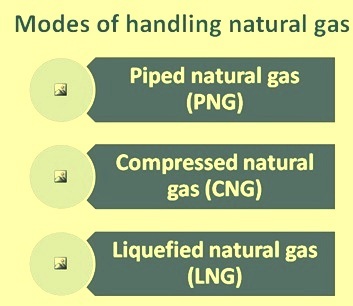 Modes of handling natural gas is given in Fig 1. NG is transported normally to long distances (up to 5000 kms) through a pipeline net work. The pressure of NG in the pipeline depends on several factors which include (i) quantity of gas to be transported, (ii) diameter of the pipeline, (iii) the distances involved, and (iv) the safety of the gas pipeline and environment. However at the consumer end the pipeline pressure is generally less than 16 atmosphere. CNG is a form of natural gas which undergoes compression (200 to 250 kg/sq cm) into containers wherefrom it is relayed to consumers who, due to geographic and other reasons are incapable of connecting into the NG pipeline. CNG is storable. Unlike NG conveyed via pipelines and immediately consumed (similarly to electricity), CNG can be used for storage and for discontinuous utilization. NG compression into containers raises risk levels. LNG is made by cooling natural gas to a temperature of minus 162 deg C. At this temperature, natural gas becomes a liquid and its volume is reduced by 600 times. LNG gas is easier to store than the gaseous form since it takes up much less space. LNG is stored at atmospheric pressure in designed vessels and is easier to transport to the users. NG is normally transported in LNG form where the distances of the destination is usually above 5000 kms. NG is a fuel found in deposits in its gas phase. It is colorless and odorless, non-toxic, lighter than air and it does not contain olefins (hydrocarbons produced during the process of destructive distillation or reforming). It is a highly flammable and combustible gas. It burns with a pale luminous flame. Its CAS number is 8006-14-2 and UN number is 1971. If the NG contains enough carbon dioxide to cause its calorific value to fall below the specified values then it is usually subjected to a process to extract this element, in addition to hydrogen sulphide or other sulfur compounds causing it to be highly corrosive and inadmissible for certain industrial applications. Once extracted, the gas is treated for the purpose of removing undesirable components such as water vapor, carbon dioxide, sulfur compounds, condensable hydrocarbons and solid and liquid particles. This process is known as gas drying. Dry gas is gas which has been dehydrated and subjected to a process in which condensable hydrocarbons such as propane, butane pentanes and higher hydrocarbons have been extracted. The amounts which may be recovered from the above mentioned components depend on the original composition of the NG and the process used to dry it. Dry gases are also known as lean gases, and wet gases are also known as rich gases. NG is a complex mixture and the constituent composition can vary from source to source. However NG is constituted primarily by methane (CH4), usually in a percentage of over 85 % of volume. The remaining percentage is composed of higher order hydrocarbons such as paraffins or isoparaffins. It also contains water vapour at varying degrees of saturation, or condensed water. It may also contain carbon dioxide, nitrogen, hydrogen sulphide and helium, among others. Typical composition of natural gas is given in Tab 1. Usually foul smelling ethyl mercaptan or methyl mercaptan is added to the extent of 3 PPM (parts per million) as an odouriser to NG so that leaks can be easily detected. Typical elemental analysis of NG shows that it contains 76 % of carbon, 23.2 % of hydrogen , and 0.8 % of nitrogen. Typical sulphur and oxygen concentration in NG are 5 PPM and 0.4 % respectively. NG is immiscible in water and the gas floats on water. NG is soluble in alcohol, ether and hydro carbons. The vapour density of NG is in the range of 0.59 to 0.61 (air=1). Its specific gravity is 0.4 – 0.45 (water=1) at -164 deg C. Its boiling point is -162 deg C and melting point is -182 deg C. The flash point of NG is -218 deg C. The lower explosive limit (LEL) of NG is 5 % by volume and the upper explosive limit (UEL) is 15 % by volume. NG has an auto ignition temperature which is in the range of 537 deg C to 560 deg C. The octane number of NG is 120-130 and stoichiometric air/fuel ratio by weight is 17.2. The heat value of a fuel refers to the amount of energy released during complete combustion of one mass unit of the fuel, with the fuel and oxidant at a reference temperature and pressure. The properties of the fuel affect heat value in that the fewer inert elements the gas contains, the greater is its heat value. NG is a fuel with a high carbon and hydrogen content, making it the fuel with the highest heat value after pure hydrogen. However, the heat value of NG normally varies according to its content of inert elements or heavy hydrocarbons. Calorific value of NG normally varies in the range of 11500 kcal/kg to 11950 kcal/kg. The adiabatic flame temperature of NG for a typical composition is 2,020 deg C in the stoichiometric condition. This corresponds to 2,026 deg C for ethane and 2,059 deg for propane. NG is considered to be non-toxic by inhalation. NG acts as a simple asphyxiant by displacing oxygen in the air. If gas escapes in a confined area, it can displace the air and its oxygen from the space. Lack of oxygen asphyxiates any person who remains in that gas filled space. Signs of asphyxiation is usually noticed when oxygen is reduced to below 16 %, and may occur in several stages. Unconsciousness leading to central nervous system injury and possibly death can occur when the atmospheric oxygen concentration is reduced to about 6 % to 8 % or less. Inhalation of high concentrations may cause central nervous system depression such as dizziness, drowsiness, headache, and similar narcotic symptoms, but no long term effects. Numbness, a ‘chilly’ feeling, and vomiting have been reported from accidental exposures to high concentrations. Symptoms of overexposure include rapid respiration, nausea, disorientation, visual disturbances, mental confusion, in-coordination, mood changes, muscular weakness, tremors, cyanosis, narcosis and numbness of the extremities, and loss of consciousness and mobility. Exposure limits of NG is based on oxygen displacement. Affected person may not be aware of asphyxiation. In case of inhalement, the affected person is to be removed to the fresh air area and to be kept warm and rested. In case large quantity is inhaled then artificial resuscitation is to be provided. Vapours are not irritating. Direct contact to skin or mucous membranes with pressurized vapour can cause freeze burns and frostbite. Signs of frostbite include a change in the colour of the skin to gray or white, possibly followed by blistering. Skin may become inflamed and painful. In case of NG exposure to skin, the clothes are to be removed and the affected area is to be washed with plenty of water. NG can be flammable when it leaks and mixes with air. The fire is caused at a right proportion of air and NG and there is a source of ignition or a flame. It can cause explosion if NG accumulates in a confined space such as in the building where there is not enough ventilation. In case of leakage, steps are to be taken to shut off leaks if it is without risk. Everyone in the vicinity is to be warned that the air mixture is explosive. All ignition sources are to be eliminated if it is safe to do so. If spill or leak has not ignited, determine if water spray may assist in dispersing gas or vapour to protect personnel attempting to stop leak. Adequate ventilation is to be used to keep gas and vapour concentrations of NG below occupational exposure and flammability limits, particularly in confined spaces. Explosion-proof equipment and lighting are to be used in classified/controlled areas. In case of fire, the burning gas is allowed to burn and not to be extinguished unless leak is stopped safely. If a NG fire is extinguished and the flow of gas is not stopped, a highly explosive NG-air mixture can accumulate, creating a potentially dangerous hazard if a new source of ignition is introduced. Normally water is used to cool equipment, surfaces and containers exposed to fire and excessive heat. For large fire the use of unmanned hose holders or monitor nozzles are advantageous to further minimize personnel exposure. The area need to be isolated, particularly around ends of storage vessels. Large fires typically require specially trained personnel and equipment to isolate and extinguish the fire. A very dangerous hazard exist when exposed to heat or flame. Fire extinguishing media are foam , dry chemical powder and water spray. CO2 is unsuitable extinguishing media. Water jets are not to be used. During fire the containers are to be kept cool by spraying water if they are exposed to fire or heat. If not cooled sufficiently, containers can explode in fire. If fire is big, the surrounding areas are to be kept cool by spraying water. Safety equipment are to be available/worn as required to protect ears, eyes, feet, hands, head, remaining body area. Work around/with NG gas is to be performed by individuals qualified to work with NG. Gloves are normally not required. Positive pressure, self-contained breathing apparatus (SCBA) for emergency use is needed when ventilation is inadequate. Safety goggles are not normally required. Appropriate hearing protection, goggles and clothing should be utilized when potential for direct contact with a high pressure gas release exists. Non-sparking, flame-retardant tools are to be used when working in areas where potential flash fires may occur. Spark-proof or intrinsically safe equipment are to be used when dealing with a potentially explosive atmosphere. Adequate ventilation and adequate venting of possible combustion products are required.